Store a temporal value in packed longlong format into a field. The packed value is compatible with TIME_to_longlong_time_packed(), TIME_to_longlong_date_packed() or TIME_to_longlong_datetime_packed(). Note, the value must be properly rounded or truncated according according to field->decimals(). nr temporal value in packed longlong format. 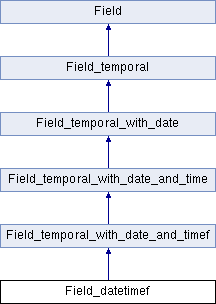 Store "struct timeval" value into field. The value must be properly rounded or truncated according to the number of fractional second digits.